Telehealth – facilitating patient care at a distance through electronics – likely emerged within a few decades of Alexander Graham Bell’s famous first phone call in 1876. Harborview surgeon Heather Evans thinks Google Glass can facilitate in-the-moment consults among surgeons during an operation, and be a great teaching tool, too. Harborview surgeon Heather Evans thinks Google Glass can facilitate in-the-moment consults among surgeons during an operation. Care providers’ use of e-communications is proliferating at breakneck speed. Hospitals are creating deep websites and secure email networks to feed patients' appetites for information and to produce efficiencies that align with “affordable care” tenets. And innovators are taking Bell’s invention to new boundaries of imagination. Dermatologist Roy Colven examines an image of a patient at a Washington correctional facility. He helped diagnose the condition as mastocytosis, a rare disorder. Scott oversees four telehealth domains; two facilitate communication between providers and two enable patient-provider communication. “Store and forward” – A physician sends a digital scan or picture via a secure online portal to a specialist for review (may or may not be in real time). For example, Dr. Roy Colven, a UW Medicine dermatologist based at Harborview, reviews images of skin conditions to help physicians in outlying areas make diagnoses. Such review is common with radiology scans; UW is also exploring its potential with ophthalmology and pathology images. Case conference – A group of doctors talks via secure teleconference about cases, often complex ones that require multi-specialty management. For example, Dr. David Tauben has for years hosted TelePain, a weekly session in which UW Medicine pain-management specialists weigh in on cases presented by doctors from across the Pacific Northwest. Rural physicians often tune in just to learn from peers’ patient cases. 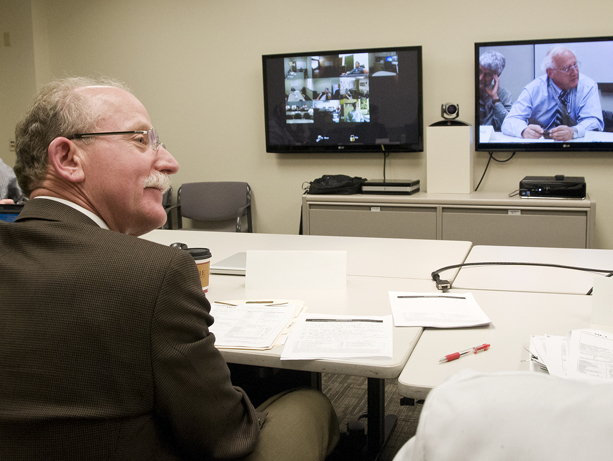 UW psychiatrist Mark Avery counsels a remotely located patient in a secure web conference. The patient's face is obscured intentionally. Psychiatrist Mark Avery counsels a remotely located patient in a secure web conference. Teleconsult – Physician-to-patient communication by phone. Usually the specialist is in the city and patient in a rural area. For example, UW Medicine psychiatrists counsel members of the Makah tribe in Neah Bay. Remote monitoring – A patient uses a device, increasingly a smartphone, at home to measure some aspect of health. Phone apps are the most rapidly growing aspect of telehealth, and their value is clear, Scott said. Apps and the other telehealth mechanisms must align with American medicine’s new “triple aim” mandate: better health, better patient experience and lower per-capita costs. So the burgeoning trove of ideas inspired by technological possibility must mesh with a new sensibility – and with operational changes that health systems are briskly adopting to comply with the Affordable Care Act.